Easiest ever Rock Shrimp Recipe! Sauté this lobster-like shrimp in Lemon Garlic Butter Sauce for a memorable meal that takes minutes to make. We are pretty lucky! We live in sunny Florida. Not only is rock shrimp plentiful, but we’re also able to enjoy this delicacy at Dixie Crossroads where it’s famous locally and beyond. If you live too far away for a visit or if you just happen to get a great deal on some as we do every so often, sautéing them on the stove-top is an easy way to prepare them. I’m partial to cooking shrimp on the stove-top because it allows easy control over cooking shrimp the perfect length of time. Not to mention, you don’t need to heat up the stove. Spicy Shrimp and Cauliflower Grits and Shrimp Zoodles both use the skillet shrimp cooking method that will get dinner on the table…FAST. When you have just a few more minutes, incorporate the shrimp into Gourmet Rock Shrimp Mac and Cheese. It’s divine! By the way, this lemon garlic butter sauce is outstanding with any type of seafood, from prawns and lobster to salmon and other types of fish. Rock shrimp (Sicyonia brevirostris) is a member of the shrimp family. It has a hard, rock-like exterior and has the taste and texture of LOBSTER! Truly. It’s not exactly like lobster…but it’s really, really good. 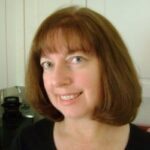 It wasn’t until a machine was invented to remove the outer shell that it became more readily available commercially. Removing the shell manually requires cutting it with sturdy kitchen shears. This video by Wild Ocean will show you How to Split and Clean Rock Shrimp. Honestly, I always buy them with the shell removed. Spoiled rotten. I know. They are delicious broiled. And, that would be my preference if they were split open with the shell in place. Once the hard outer shell is removed, this is my go-to rock shrimp recipe. Sautéing is quick and allows you to pluck them out the pan when they are perfectly cooked. The shrimp and lemon garlic butter sauce cook in the same pan. Melt and combine butter, olive oil and garlic in a large skillet. Add shrimp and toss to coat. Cook shrimp in a single layer, so they are not crowded and cook for about 3-4 minutes. Note if your pan is on the small size or it’s just too stressful keeping track of the color of so many shrimp (me!!! ), then cook them in batches, adding a little additional butter and olive oil to the pan if necessary. Also, keep a pair of tongs handy to pull out shrimp if they are not cooking evenly. Overcooked shrimp is rubbery and that’s definitely not what we are going for here. The shrimp is done when the flesh is white and the outside is pinkish. Once all the shrimp are removed from the pan to a serving dish, add additional butter, lemon juice and broth to the pan. Stir and allow to simmer for about 5 minutes to thicken. Pour the sauce over the shrimp and sprinkle with parsley, if desired! For the calorie counters, don’t lick up every last drop of the sauce and you’ll get a buttery, garlicky, lemony taste that should fit within your calorie budget. Otherwise, I highly recommend making pasta and serving the shrimp AND sauce over the top for a very memorable meal. 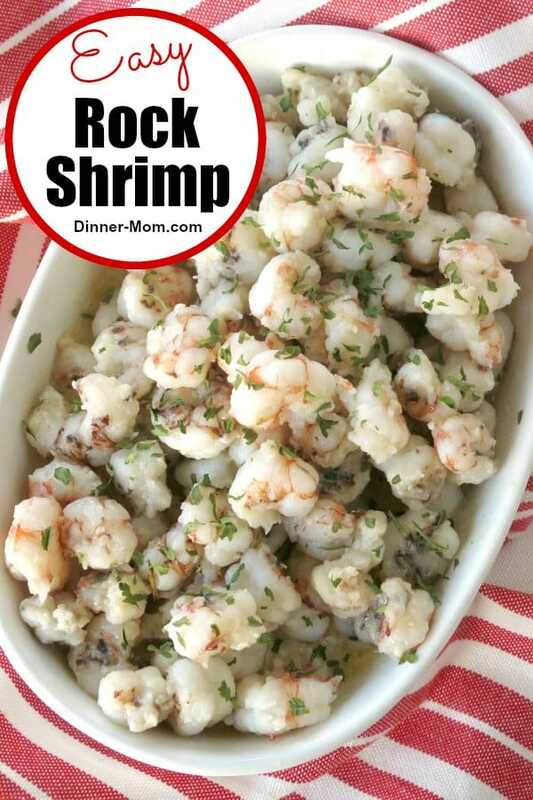 Please rate this rock shrimp recipe below and tag @DinnerMom on social media. We love to see what you are cooking up! 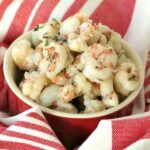 Easiest ever Rock Shrimp Recipe! Sautée this lobster-like delicacy in Lemon Garlic Butter Sauce for a memorable meal that takes minutes to make. Add olive oil and garlic to skillet and stir to combine. Add shrimp to skillet and toss to coat with butter mixture then spread into a single layer. Cook shrimp for 3-4 minutes, stirring to make sure all sides are done. Shrimp are done when the flesh turns white and slightly opaque. Keep tongs handy to lift any out that are finished early. Remove shrimp to serving dish. Once all of the shrimp are removed, melt 1 Tablespoon of butter in the skillet. Add lemon juice and vegetable broth and stir to combine. Allow sauce to simmer over low heat for about 5 minutes in order to thicken. Pour lemon butter garlic sauce over shrimp. Garnish with chopped parsley if desired. Big fan of Dixie Crossroads and wanted to tell you home much we like rock shrimp. 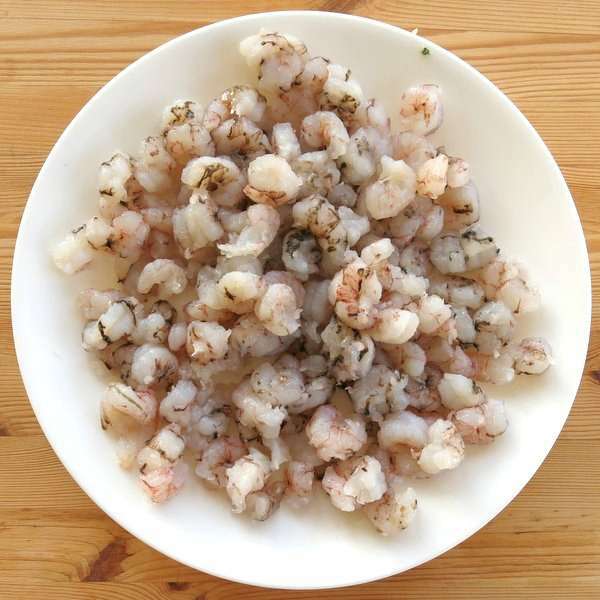 Recipe is perfect for any type of shrimp. I’m so glad you like it! 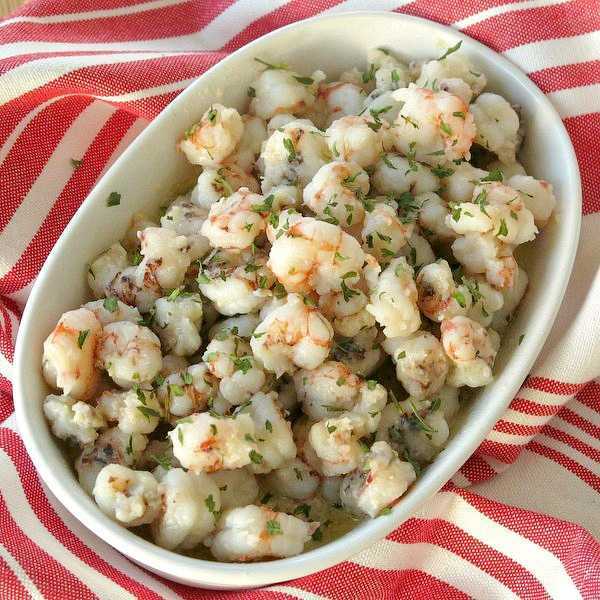 It’s definitely great for any type of shrimp and scallops too! So good… How do you come up with such great dishes!! Looks amazing but would 5 mins really be enough time with pressure king cooker? Especially with natural release?